What with all the carping and kvetching of late, I thought I'd start an omnibus post thread for various items of interest, but which aren't necessarily directly connected to CM. Putin's hybrid warfare as applied to Estonia. We pick up the story after the Green Men, but operating in mufti, have begun to arrive and operate, as the Kremlin seeks to create domestic terror and conduct destabilization ops, thus "justifying" intervention to protect ethnic Russians. Estonia has a potent weapon to use, the issuance of full citizen status, expressed by passport color, to the previously rights restricted ethnic Russians, thus removing the single biggest exploitable grievance, the second-class status of ethnic Russians there. Naturally, this is the last thing the Kremlin wants, for it sees the opportunity window closing for moving against Estonia, together with the cascading opportunities therefrom. The situation is one in which swift action must be taken by the CIA officers, but it must be the right action, too and not turn a small fire into a conflagration which might bring direct Russian attack upon Estonia. Estonia is a NATO member, but Estonia's leaders are deeply unsure NATO will intervene if Russia does attack. Whoever's writing the new season got into/read some serious research of various aspects of the fraught situation, resulting in all sorts of wonderful grog chrome, including Russian hackles raised over their war memorials but Estonia's symbols of oppression and repression, Stasi, raising and motivating UNCONs, covert bases, stealth transport, wet work and more. The episodes I saw were so gripping I would've binge watched the entire season had it been available. The new season of "Berlin Station" provides its viewers with a real understanding of the nuts and bolts of hybrid warfare in the target country, in a way none of the news coverage really could, but presented as an engrossing, immersive and oft disturbing spy story. CMBS doesn't have all the pieces yet to model it there, though am sure something could be done with a bit of cleverness. CMFS and CMFS2, since they have UNCONs, offer considerably more options, but would require tons of reskinning alone for buildings and terrain, let alone the troops. For once Luke, we are in total agreement. Came across a video detailing the top ten cancelled military ops which supposedly would've changed everything. Though lamentably short in terms of length of explanation, it was worth watching, not least because it talked about planned ops I'd never heard of, some of strategic import. The time span was some 150 years or so, too. An outfit called 9-Hole Review has a series of practical accuracy test videos, where the shooter is prone and is using a pack for a weapon rest. There is a spotter, and he is feeding his corrections back to the shooter. Shooter and spotter are the same in all tests. Firing is done from 150-500 yards vs torso size targets, with two hits required on each target save the last, which must have at least one. An added twist is that sometimes the shooter has no familiarity with the weapon or the weapon has issues, such as localized bore erosion from firing hot cordite loaded ammo or recalcitrant actions. There are ammo issues, too, where one weapon may be firing modern match grade to get the correct velocity, but another one will be firing ammo which could be almost 50 years old and isn't match grade. You shoot what you can get. None of these weapons is either brand new or as new condition. Whether you're a shooter or not, these videos nevertheless give worthwhile insights into what the soldier faced in using that particular weapon. The videos run only under ten minutes, and the firing results are presented as histograms, but they're not up long, so be ready to Pause. Whether the official and unofficial CM testers will find them useful I can't say, but I'm learning a lot from them. Believe you'll come away from watching these with a whole new level of both understanding and appreciation for these iconic service rifles, including the many approaches taken to getting lead on target. Some surprises await. Have been a buff of the Roman legions and gladiators since I was little, and looking at soldier and gladiator figures on Amazon reminded me of something most people who see gladiators in films don't realize. The fights were refereed. 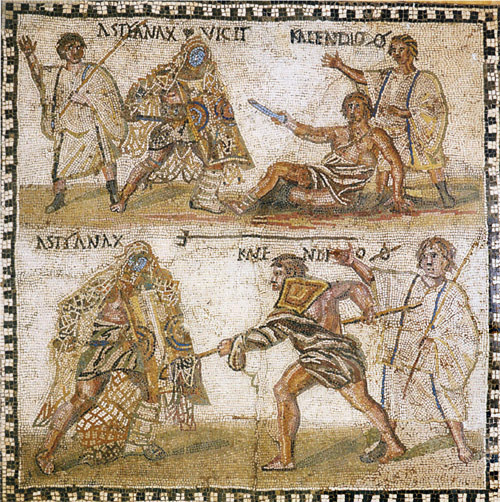 The proof is in this period mosaic depicting a retiarius (net and trident man) vs a secutor (follower, or retiarius killer). The literature of the time talks about them, too. Here's a different mosaic, with referees actively involved. Looks as if the retiarius unable to finish the secutor, despite the net being all over him, resulting in the retiarius ultimately asking for missio (release, lost but not killed) after being badly wounded, but the request was refused. The bar through the circle shows that was what happened. The secutor was Asyanax, the retiarius Kalenendio. The outcome is clear." Astyanax conquers." Here's another fight, evidently so big a deal even the ref is named! The figure on the left is a threx, typically referred to as a Thracian. Note the curved sword eabling stabs over and around the shield of the foe. Apologies on the pics, which seem to decide on their own whether or not to display! The refs aren't shown in this excellent video by the German re-enactor group depicting the ludus (gladiator school) Amor Mortis (love of death). The closest thing to a ref is the big cheese, the lanista, the owner of the ludus. Here's a remarkable animated doc on Ancient History and warfare which came to me as a total surprise.Would you believe Greeks vs Chinese? Also on offer is this oh so period short doc on the LVT, something we're supposed to get, I believe, as the last CMBN Vehicle Pack. Must say I find it disconcerting that Periscope Films somehow winds up owning our wartime doc. Suspect what it really is that Periscope Films earns the digitally restored version it created. WW I slaughter in two pics! 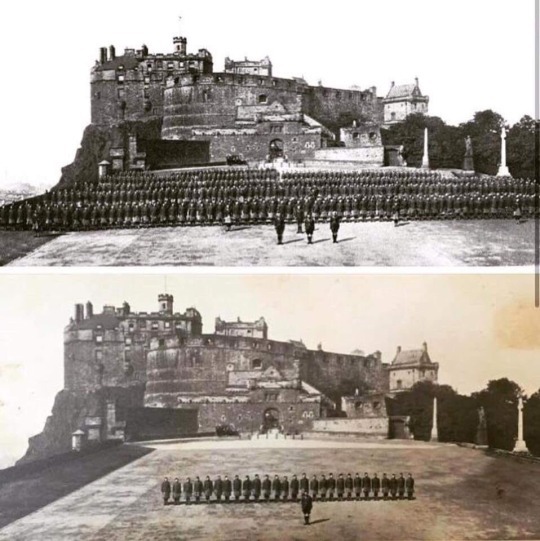 A battalion of the Cameron Highlanders in 1914 and the same battalion in 1918. This reminds me of a thought I've sometimes had. Of all the German soldiers who participated in the invasion of Poland in 1939, I wonder how many were still alive when hostilities ceased six years later. Well, if you take the actual original participants (to not include replacements) in say a Division from 39' to 45', then my guess would be about 10% left. I wonder if this included replacements, if not, then that Battalion would have been completely down to 0 by wars end...However, as a Battalion becomes smaller and thinner during the war it would tend to take less and less casualties (thou, the % would remain roughly the same). The Russian survival rate for the GPW was ~1% for those in it from the beginning to the end. Haven't seen any direct figures on the Germans. A for the Cameron Highlanders, the second pic consists solely of men from the first pic. No replacements. A for the Cameron Highlanders, the second pic consists solely of men from the first pic. No replacements. Right. That is to say that although there were replacements as the war wore on—lots of them—they are not present in the second photo. Any of you using die cast aircraft, transport or AFVs in your non-CM gaming, may be interested to know a firm (under the Deagostini aegis) called Model-Space is holding a 50% off sale through January 8. Never heard of the firm until a CoC colleague posted a pair of pics depicting to Russian BA series armored cars, but what I saw looked good. In 1957, for a time, the "Silent Service" (USN submarine force) talked about what it did and how it did it during Wold War II and Korea, via a TV show called "The Silent Service." The brainchild of retired Rear Admiral and sub combat veteran Thomas M. Dykers, he created, wrote and executive produced it from 1957-1958. The episodes are dramatizations of real events using the actual names of the participants and wartime film, too. Also, every episode has a short segment in which RADM (RET) Dykers introduces the viewers to a historic submarine person and speaks with him briefly. Adding greatly to the immersiveness is that the Navy, which loved the idea, lent him the USS Sawfish (SS-276), a Gato-class boat typical of what we fought the Japanese with in the Pacific. If submarine warfare is your thing, I highly recommend you watch these, for they're a real bubblehead treat. Strongly suggest theater mode, unless you like staring at the otherwise blinding YT white while trying to watch. I watched The Silent Service avidly as a kid and would endorse what you say about it. The '50s were kind of a golden age for documentary tv shows dedicated to WW II at least in part. There was also Navy Log, Air Power, The Big Picture and let us not forget Victory at Sea. And probably a couple others I am forgetting. You're welcome! Have watched/devoured three now myself and am already fretting over what I'm going to do after I run out of episodes. If aviation, ordnance, artillery, AFVs and such are of interest, then may I suggest you suffer possibly permanent SAN loss by repairing to a fabulous site called SpitfireRepairs where these and more await. There are even juicy combat glider tidbits associated with minor stuff like D-Day and MG. Site's close to 100 pages of grog gloriousness and probable fiscal ruin if you lack impulse control. Great news! Santa (via Amazon) delivered this long sought book today. Wasn't thrilled to have to do PB format (HC too rich for my blood), but am delighted to report the pages are crisp, clean and on heavy enameled stock, making for fabulous photo quality. Will also hold down your papers in anything short of a gale! Am looking forward to finally learning the truth about Prokhorovka. Well, plz just tell us the myths that are being demolished and save us a lot of time. Oohh damnit you got here first Erwin. Tell me John - are you REALLLY REALLY checking for any shady Kampfwagons that may be converted Ice Cream nuke VBIEDs? Since I haven't read it yet, I can't! On a more topical note, I found this great WW I pic on Tumblr. Pretty sure it's combat, not exercises. Unfortunately, there's no caption. Why I will NEVER understand fashion!. Can you imagine when they, er, switch on? That's probably just her food supply for the week. What a delightfully twisted mind you have! Would never have occurred to me to think about that angle.